Product code: ES7327 Categories: Sold Items, Sold Rings. 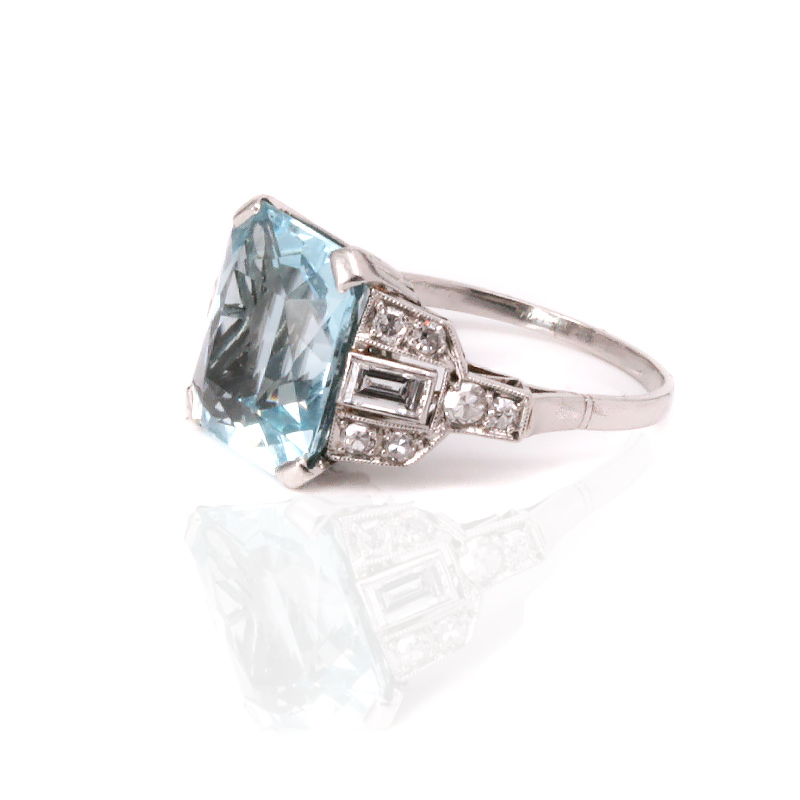 Here is a truly exquisite Art Deco aquamarine and diamond ring that dates from the 1930's and has been so beautifully designed and set with the most wonderful aquamarine that is highlighted by diamonds. Expertly hand made in platinum, in the centre is that gorgeous aquamarine that measures 6.20 carats and has the most perfect blue colour to it. Aquamarine came from the words meaning “two handfuls of seawater” and when you look at this aquamarine the term can be so aptly applied. The colour is so perfect and kept to its colour thanks to being set in platinum which is a pure white colour and was the most popular precious metal to be used during the Art Deco period. Set on each side are six single cut diamonds and one baguette cut diamond with the diamonds having a total weight of 0.64 carats and the design if the setting for the diamonds really enhances the ring so much more and highlights the quality and style of the period. Measuring 21.7mm across from the diamonds on one end to the other side by 12.7mm, this is such an elegant aquamarine and diamond ring that will always stand out for its elegance, class and sophistication. 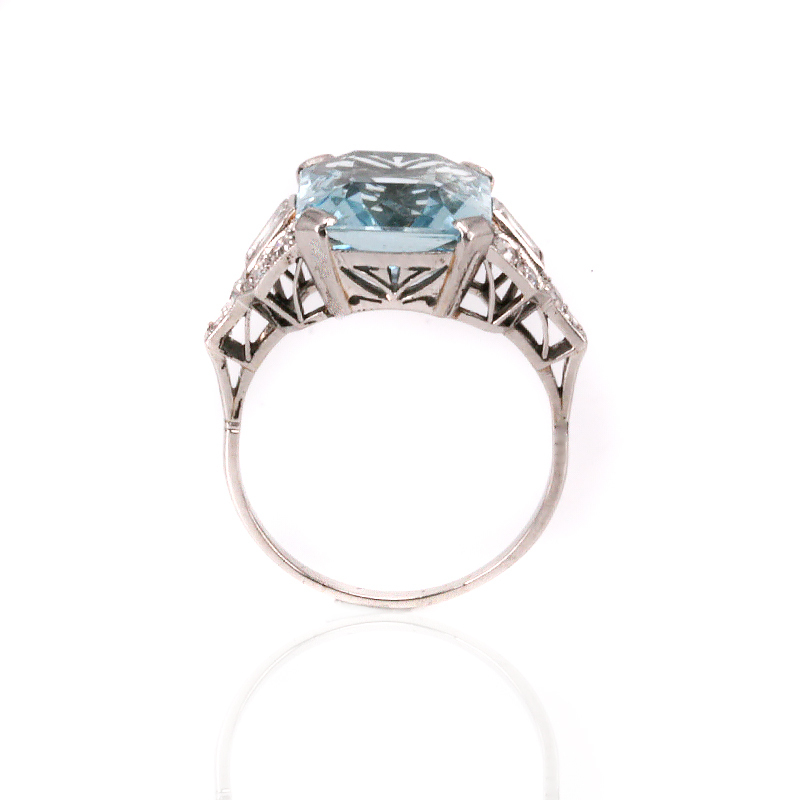 Tag: Art Deco aquamarine and diamond ring. Platinum Art Deco aquamarine and diamond ring dating from the 1930’s.